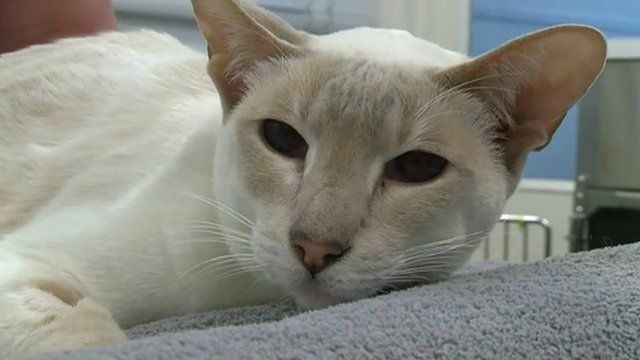 'Cat-in-the-box' survives eight days in post Jump to media player A cat has survived eight days trapped in a box of DVDs which was posted from Cornwall to West Sussex. Tourists flock to Japan's Cat Island Jump to media player Tourists from around Japan have been flocking to a tiny fishing community, to see what has been nicknamed Cat Island. Animal hoarders: 'I had 28 cats in my home' Jump to media player The RSPCA in England and Wales is taking a new approach to tackling the issue of animal hoarding. Cat runs on court at Qatar Open Jump to media player Play is interrupted at the Qatar Open when a cat runs on the court during Roberta Vinci's match with Cagla Buyukakcay. A symphony just for cats Jump to media player David Teie, a cellist for the National Symphony Orchestra, has studied what sounds cats prefer and composed music just for them. Team Cat or Team Dog? Jump to media player Jenny and Martin went to a Primary School to find out what kids there think. Robot cat companion for the elderly Jump to media player Hasbro has released a robotic cat which is designed to be a companion pet for the elderly. A cat has survived eight days trapped in a box of DVDs which was posted from Cornwall to West Sussex, more than two hundred and fifty miles away. Vets in Worthing traced Cupcake's owner through her microchip.